Not only J.Lo has an exaggerated and hyperextended lumbar curve of the spine at the vertebrae L1-L5 ant that is called Lordosis. 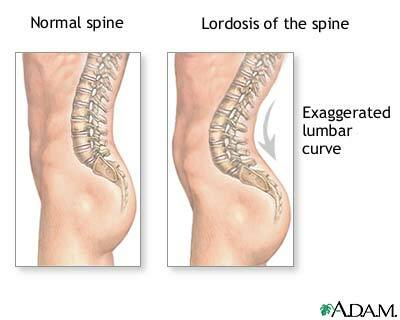 Lordosis is a condition where the muscles of the abdomen tend to be weak and the hamstrings and lower back muscles have become shortened and has hardened. To help to strengthen the muscles and soften the tissue you can do the following asanas. Sitting forward bend, Paschimottanasana, lengthens the muscles of the lower back and it gives a good stretch of the hamstrings – as these muscle groups tend to be short and hard this asana will slowly ease the hard tissue and boost flexibility. Good is to stay for as long as possible in the asana and breath through the stretching. The Cat, Marjari, is a good asana that strengthens the abdominal muscles in the same time as it stretches out your lumbar and thoracic muscles. It improves the flexibility of the neck, shoulders and the spine. If I was J Lo I would practice Paschimottasana, Marjari and also add Padangusthasana and the Sasangasana that helps to stretch the hipflexes, and do it on a daily basis!